All the diving in Coz is great, but we did three shore dives that were as good, or better, than the boat dives! :-) And at $10 for tanks and weights, (we had our own gear) you can't beat the price! Since these shore dives were as good or better than some of the boat dives, and they where good for an hour, I thought I'd post some details, to let others know of the opportunity. The first dive I'll discuss was at Chankanaab Park. This is a beautiful park, wonderfully kept, and worth visiting even if you didn't dive! They've got gardens with beautiful walkways, and a host of fabulous Mayan artifacts and statues. There are good restaurants and shops right in the park, along with all the typical amenities. Four huts on the beach rent scuba and snorkelling gear. Oh yes, there is a $10/person admission to the park, but the park alone is worth that. 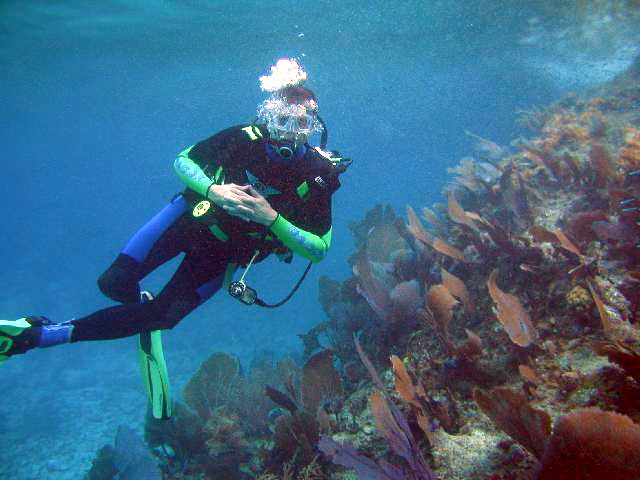 Plan on spending some beach time after your dive. Most everyone at the park are swimmers/snorkellers/sun bathers, so you'll have the bottom pretty much to yourself. Here's the key to diving Chankanaab. Start at the extreme south end, which is where we found the best part of the dive. The few other divers just jumped in right where you rent your gear, but we humped our gear down the beach, to drift back the full length of the entire park, which made all the difference. (Actually, I humped my gear, then went back to get my wife's gear!) You can walk through the sand, but that was really hard. There is a one foot wide stone seawall about a foot high, and I found it easier walking along that, since it was like a narrow sidewalk. Be careful, if you loose your balance on the sand side, no problem. If you loose your balance on the water side, it's five or six feet down to some really sharp looking coral rocks. You'll surely snap the first stage off your tank, and the ensuing rocket action will blast you all over those jagged shore rocks, shredding gear and body parts as you go. :-) Somehow that image wouldn't leave my mind as I walked along the wall. The beach/waterfront part of the park is about 500 yards long, the current was very mild, and we spent an hour covering the distance and poking around. The depth is 10' to 30', so you get lots of bottom time. I hate walking any distance with my gear, but this was worth it! We ended up chatting with Ramon Zapata, who runs the first rental hut you come to, as you walk down the beach. His grandfather was apparently one of the fist guys to start teaching scuba on the island 50 years ago, and he has some cool pictures hanging on his walls. Also worth noting is the map of some of the caves that leave the shore and go for over a mile back under the island. Ramon, being a cave diver, helped map some of that virgin territory in past years. So let's do the dive. At the extreme south end of the park, there is a stainless steel ladder leading down into the water, at a tiny little cove, you can't miss it. 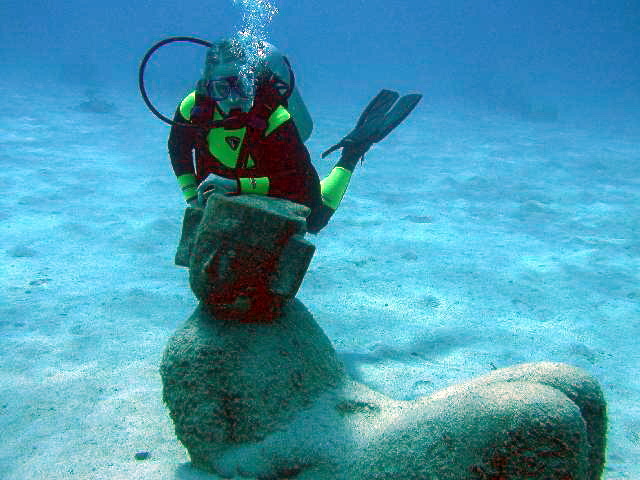 As soon as you get into the water, there is some very cool visibility weirdness to check out. Fresh water flows out of the cave system right here, and the mixing of the fresh and salt water is really interesting. At first glance it looks oily, but of course it's not. The depth is only 8' or so, but take some time to observe the effect, you don't see this kind of situation very often. After this, head out from the ladder at about a 45 degree angle, continuing south for about 50'. We found a dozen squid hovering in their typical line formation, with the big sentry squid at one end. You might think it's crazy to suggest you might find them, but we actually did this dive twice, and the second time, three days later, the squid were still there. Maybe they hang out there all the time. :-) They were about five feet below the surface, and the water there was only about ten or fifteen feet deep. Remember what this month's Scuba Diving magazine says about how the dive masters can always find the interesting marine life? 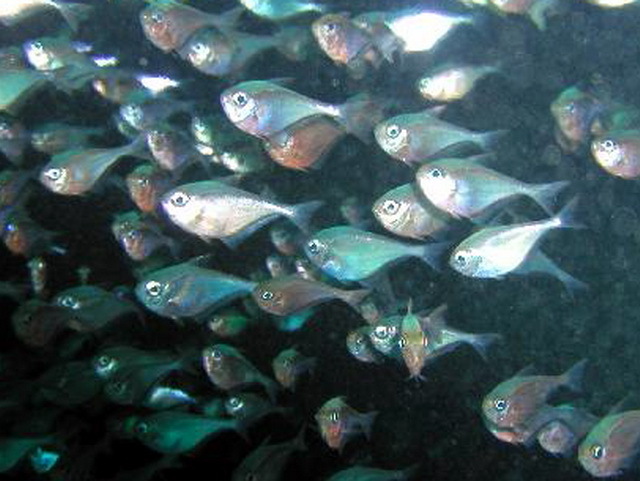 A lot of fish are territorial, and can be found at the same general area on every dive! Maybe these squid are like that? And they were big, for what I've seen. These were 9" to 12", and seemed easy to get close to. Approach very slowly, and take your time. We easily got to watch them for five or ten minutes, from about six or seven feet away. It was awesome. 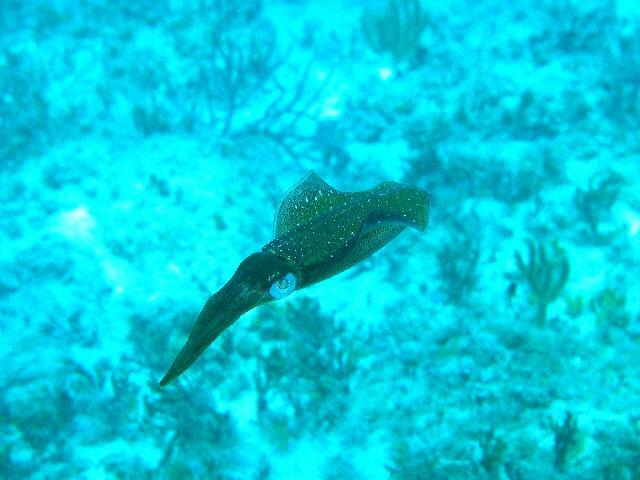 Squid have got to be one of the most interesting things to watch, with their big eyes staring back at you! Head right back to the ladder area, you don't want to miss the caves! Swim north, and just a little way from the ladder area, you'll find a large grotto cave. The opening was very large, and leads into a small room that was about 15' wide and deep. Lots of daylight streaming in, and sand on the bottom, so it's quite safe. DON'T go exploring. This is the entrance to a mile of cave, and we only checked out the entrance cavern rooms. You are in an overhead environment, so be careful. Here is the awesome part. 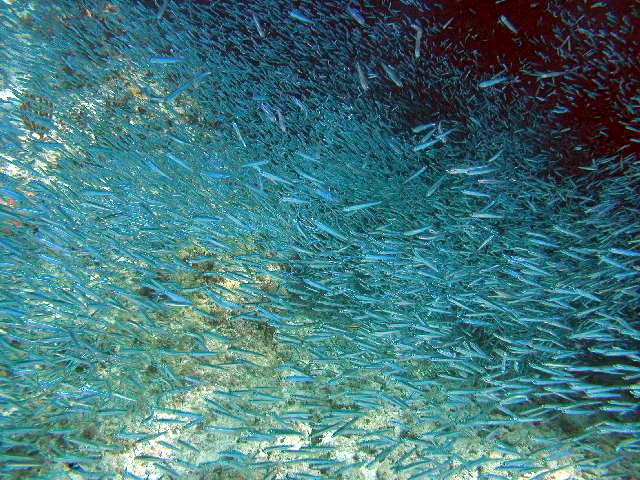 There were thousands of Silversides, (Anchovies and Herrings ) and thousands of Glassy Sweepers, swimming around the entrance and inside the cavern. 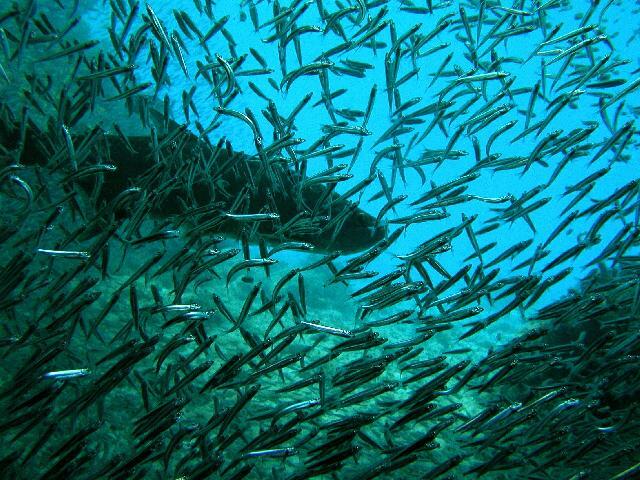 And there were five or six big Tarpon constantly cruising these big entrance rooms. Diving with these fish was really incredible. And, there is a nice little swim-through between the two little caverns. Diving these two little caverns you are never more than 20' from open water. 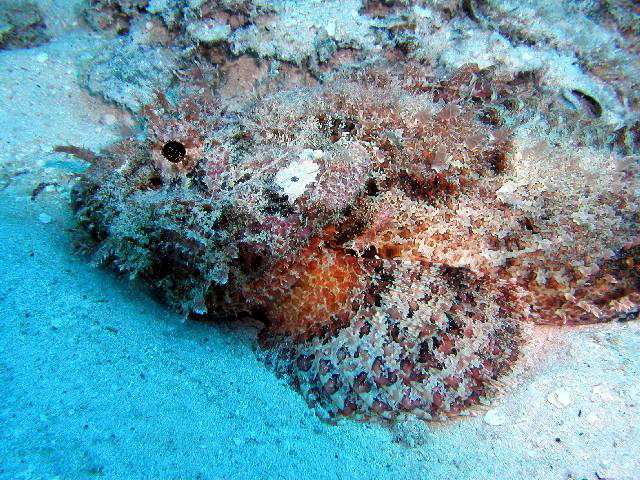 And a big beautiful scorpion fish. My wife found this one, and she was glad she spotted it. 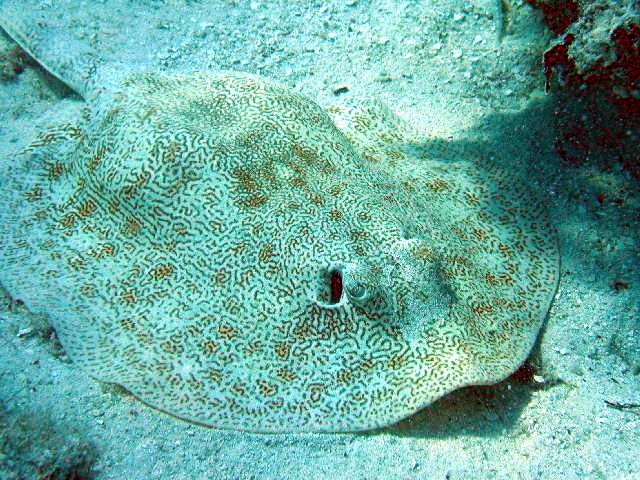 They ae pretty hard to find, and on our trip last year to Bonaire, everyone found one but her! 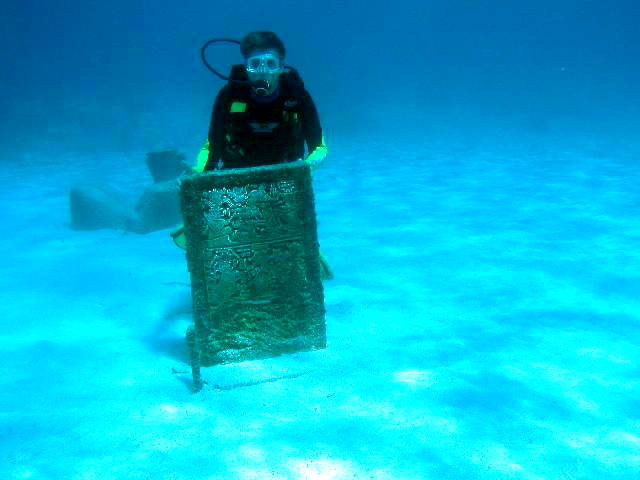 Two other interesting things to bump into are a Mayan tablet and a Mayan statue! 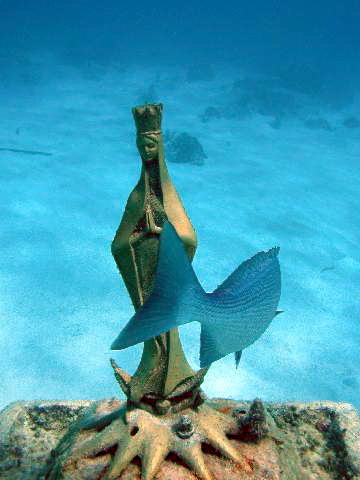 These are the real thing, and I suppose would be worth huge amounts of money, since they are genuine Mayan artifacts, placed underwater, as part of the Park. We followed a Yellow Stingray for a while. I love how these guys move through the water. Fortunately, we're standing on the bottom in ten feet of water, forty feet from shore. I'm thinking, "I'm sucking this tank dry before I give up this game." 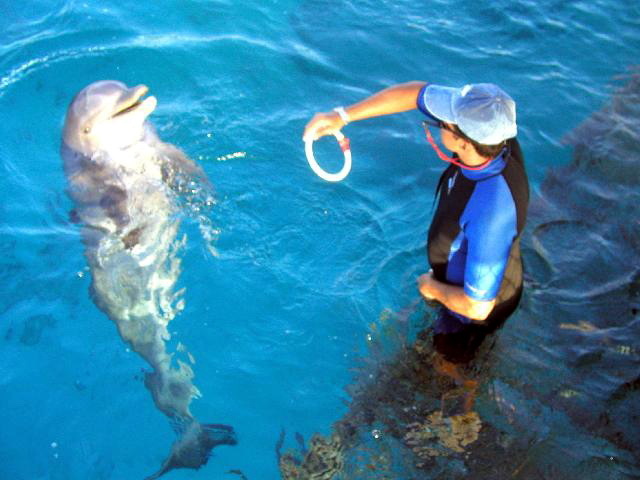 "This is one of the coolest things that's ever happened to me on a dive!" Since my reg was actually at a depth of about five feet, I was amazed how long 100 psi lasts at five feet! Finally we got out, using the ladder right there at the dock for the "snubba experience." We dropped our gear, and walked along the board walk of the Dolphin areas and watched the trainers play with the Dolphins since it was the end of the day, and the tourists were gone. 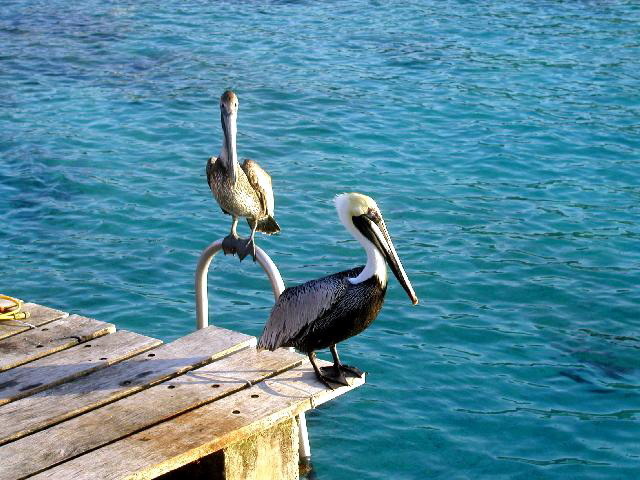 These two Pelicans, sitting in the sun, seemed to be watching our gear for us, and made for the perfect end of a great dive day! Great report. Really good use of the photos too. 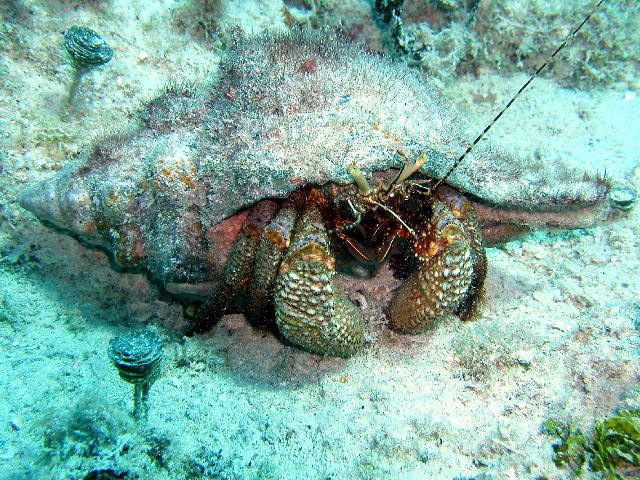 This is exactly how I feel about shorediving in Cayman. Nicely done. Great pics. Shallow sand diving is highly under rated. Very good. I've done that dive and will do it again. Rockin' report! I've done Coz a lot, but always avoided Chankanaab because of the tourists and crowding- now I think I'll try this dive when I go back over Thanksgiving. Thanks! Interesting reading. I too have found some great shore diving in Cozumel, especially night dives. I've some great shots from our night shore dives. I've found Chancanab can be a great twilight dive too. Great report. I'll definately try this dive out. Well done. Usually shore diving info of Coz is the airplane at La Ceiba and Villblanca. Good information and well written. Pics were way cool. I'm about to go on May 10th to stay at Fiesta Americana and really appreciate the lowdown on the shore-diving in the area. Thanks! Great Story with Great Photos, I felt like I was there while reading it!! Wonderful reports and photos. Great job! I'm going to Coz in 20 days and had not considered a shore dive at the park thinking it wouldn't be much good ! Your pictures are so clear too Thank You for this report ! great report - you've convinced me! Everybody rants about the drift diving and reefs in Coz and I have to admit that I'd never really examined shore diving opps. in past trips. Be assured that I'll be taking advantage of unlimited shore diving with my package in July to explore the spots that John has pointed out. Massive Kudos to John for his post and his excellent pics.